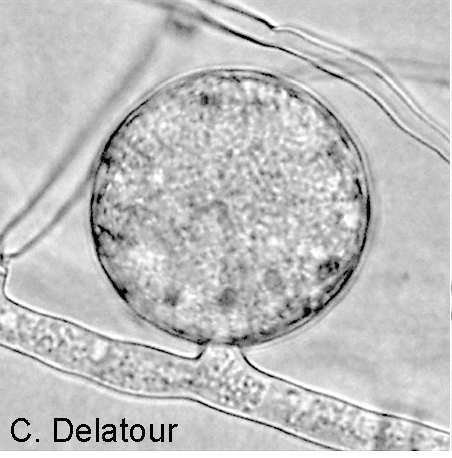 Etymology: refers to the development of chlamydospores in a lateral or sessile position on the hyphae. 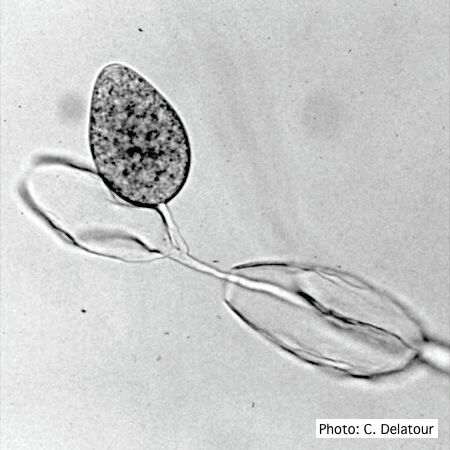 Sporangia (average 26–60 µm x 12–20 µm) in water are ovoid, obovoid, or obpyriform. They are non-papillate and persistent, on simple sympodial sporangiophores with internal proliferation. Hyphal swellings are absent. 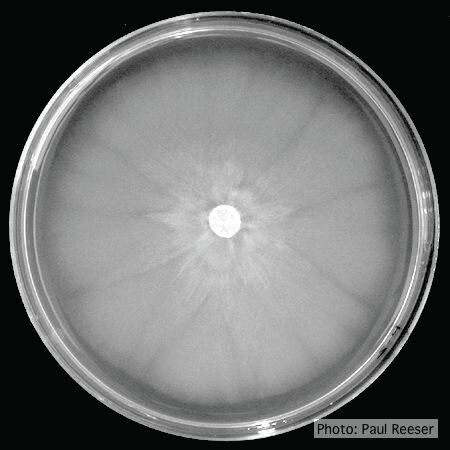 Thin-walled chlamydospores (20–77 µm, average 40 µm) are formed in broth or agar. They are sub-globose to globose or irregular, terminal or intercalary, sometimes positioned laterally or are sessile on hyphae. Considered homothallic, but oogonia normally not seen in culture. Sporangia with external proliferation (left) and internal proliferation (right). 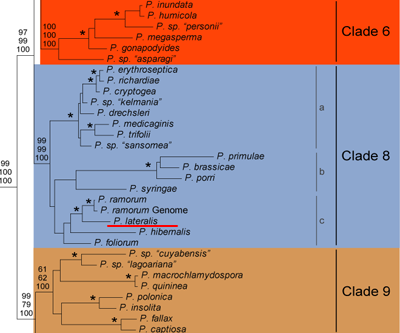 Molecular studies place Phytophthora lateralis in clade 8 (Blair 2008), as a sister group to P. ramorum, although the two species are morphologically distinct. More information about the phylogenetics of this species can be found at http://www.phytophthoradb.org/lateralis. Phylogenetic tree from http://www.phytophthoradb.org/lateralis (Blair et al 2008). Temperature optimum ca. 20°C, min. <10°C, max. ca. 25°C. Growth at 20°C on V8 agar 2.1 mm/d, on cornmeal agar with 20 ppm β-sitosterol 1.3 mm/d, on cornmeal agar with pimaricin, ampicillin, and rifampicin 0.6 mm/d, potato dextrose agar 1.4 mm/d. Growth morphology at 14 days on V8 (left) and potato dextrose agar (right). 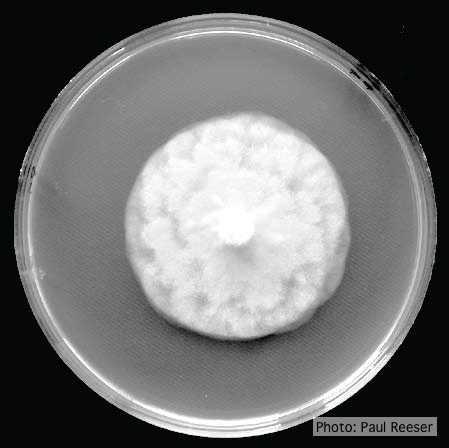 Colony morphology on V8 agar is nearly patternless and appressed with no aerial hyphae. 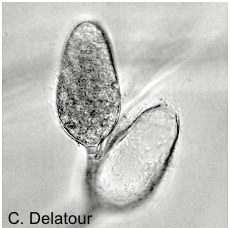 In combination with the lower maximum temperature for growth, this feature is especially useful in distinguishing P. lateralis from taxon “pg chlamydo” which also forms lateral chlamydospores. Microscopically on CMAB hyphae are usually tortuous, irregularly branched, and often irregularly swollen. Sporangia develop on washed mycelial mats grown in pea broth and transferred to natural stream water. 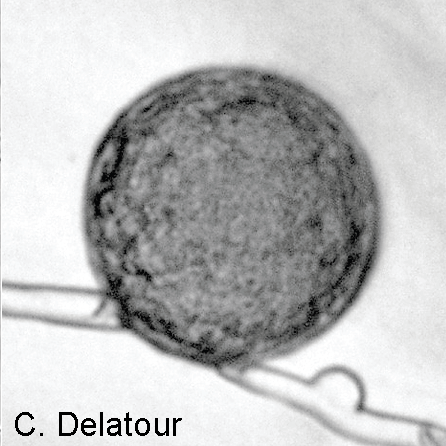 Occasionally isolates exhibit caducous sporangia. For more information about Phytophthora lateralis, visit our Disease, Education and Management materials, and Reference sections.